Spookie Boogie is a game in which you help the ghost of Sir Clockengurch, who was a saxofon player, to kick some teens out of his Manor when they summon him from hell using a Ouija board. If you manage to scare the teens out of Sir Clockengurch home, you win. 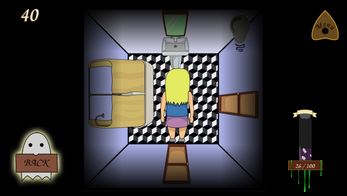 Tap the furniture to interact with it and scare the teens, but take care, they arent all scared equally by every object in game. The mobile version has some hidden tricks: activate the furniture shaking the phone or blowing air at them! Fill the Spook-O-Meter to win in classic mode, or play endless mode in Time Attack, where successful spooks give you more time and more points! Share your score by typing your name in and playing Time attack to enter the Leaderboard. Available for Android, Windows and web browsers (WebGL). Translated to English, Spanish, Catalan and Japanese. 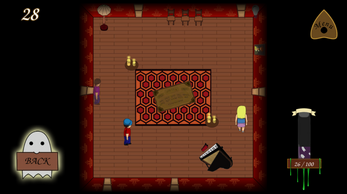 Spookie Boogie was developed during the 2016 Global Game Jam at Gandia (Spain) and during the following weeks, by the Jumble! Devs team. Check the in-game credits for more info! The game's web version has been tested on Firefox, Chrome, Edge and Chromium, under Windows, Mac OS X and Linux. The Android version has been tested under several devices with Android 5 and 6. If it doesn't work for you, please tell us!